Heat the sauce in a 12-inch skillet over medium heat to a boil. Place the chicken in the skillet and turn to coat. Reduce the heat to low. Cover and cook for 5 minutes or until the chicken is hot. Top the chicken with the cheese. Cover and cook until the cheese is melted. Serve the chicken and sauce on the rolls. Easy Substitution: You can also use frozen fully-cooked breaded chicken cutlets or patties. Prepare according to package directions before using in this recipe. Ingredient Note: You can use 6 tablespoons grated Parmesan cheese instead of the mozzarella, if you prefer. 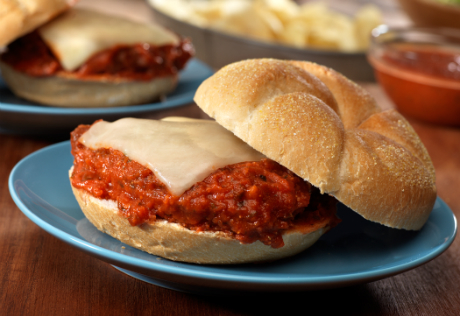 Just sprinkle the cheese over the chicken and sauce after assembling the sandwiches.